Recent scientific evidence shows that plants that are native to Britain are not the only ones that will support pollinators, however care is still necessary, as non-native plants vary in their value to pollinators. By analogy with pollinator-friendly horticultural practice in other countries, I suggest that gardeners should give preference to plants from our wider biological region, which is Western Europe. This approach is in harmony with the scientific evidence and gives gardeners a lot of scope. 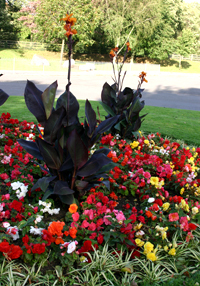 Floral displays such as the Cannas and double-flowered Begonias pictured left win Britain in Bloom prizes and brighten our towns and villages but they generally provide nothing for insects. A healthy insect fauna is so important to achieve, that we need to re-think what constitutes good practice in ornamental horticulture. In their search for uniform, brightly coloured, trouble-free bedding plants, hybridists have left the insects' needs completely out of the equation. The result is 'dead' parks and gardens without the life and movement provided by bees, butterflies and hoverflies, with empty skies above as the swooping swifts and house martins look for their insect food elsewhere. Progress has been held back by a presumption that to best support insects in gardens you have to grow 'native wild flowers', which in the UK are limited in number and not always easy to grow satisfactorily in a garden setting, let alone in a public park. Some of them need specialist knowledge and experience. Also, the notion of worthy but dull 'wildlife gardens' composed only of British native wild flowers can put many garden-owners off; filling the garden with cheap and cheerful bedding plants seems so much easier. At present, what is available to gardeners as bedding plants does not serve insects well. We need an attractive, sustainable alternative. I propose an alternative approach, described in the short article below. There is still much more to be learnt, (for example, how to meet the difficult challenge of creating wildlife-friendly planting schemes for hanging baskets) and there is plenty of scope for experimentation. The following is a short summary of a presentation I gave to a meeting of the Wildlife Gardening Forum in June 2011. Since I gave this talk, the first 'Plants for Bugs' research results have been published, which are broadly in harmony with this position. Flowers evolved with pollinators, not for people, so I approach garden planning from the pollinators' perspective. Insects feed on pollen, nectar or both, and it isn’t just bees, but butterflies, moths, flies, wasps, and hoverflies too. Currently, UK honey bees populations are low, and can only provide 34% of our pollination needs, down from 70% in 1984 (1), meaning that the bulk of UK pollination is now effected by wild bee and hoverfly species. 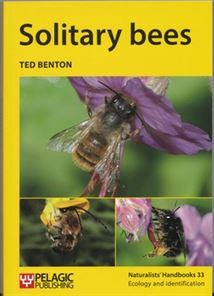 I have found much useful advice and inspiration about planting for pollinators from the Xerces Society in the USA (2), and the German organisation Naturgarten eV (3). 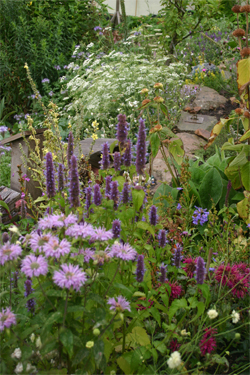 The photo shows part of my “Pollinator Border” in 2010, designed to be attractive to a range of wild bees and hoverflies. It is a planting style familiar to most gardeners, essentially a form of the classic “cottage garden” in the style of William Robinson, Gertrude Jekyll and Beth Chatto. The relaxed planting is one matter; the choice of suitable plants is another. Should we plant anything that looks pretty (which is the basis on which garden centres operate)? Can we include “exotics” – plants from distant lands? Or should we use only UK native wild flowers? The traditional summer display of hybridised bedding plants produces a “riot of colour”, but next to nothing for feeding insects. Most are double or otherwise highly bred flowers, selected for visual impact not environmental qualities. Could we work to create a new paradigm for wildlife-friendly bedding? The majority of exotic plants in our gardens are likewise of limited value. Many are scarlet or orange, an indication that they evolved for bird pollination. Such plants include Kniphophia, Fuchsia, Callistemon, Fritillaria imperialis, and lantern-flower, Crinodendron. Some bumblebees will have a go at some of these, but on the whole they are not suited for the majority of British insects. Should we confine ourselves therefore to “native” species ? Unfortunately, there is a rather limited choice, because the British flora is so depauperate. There is also a problem of the short flowering season of most natives, with very few late summer flowering species. But is the concept of “native to the UK” really valid or meaningful? Remember, we are talking about gardens not nature reserves. The UK is nothing more than a peninsula of Europe, and has only been separated for some 8,000 years, after a brief post-glacial period of recolonisation across the north sea land bridge. Our flora is a shared subset of that of western Europe, as is our insect fauna. American websites don’t say “use plants native to your state or county”, but “use plants of your region”. Likewise in Germany, gardeners are advised to use plants from middle Europe. 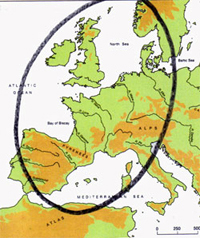 I choose western Europe (as circled on map, left) as the main region of origin of plants for my pollinator border. Some examples of such plants would be Lamium orvala from central Europe, Anthemis tinctoria from Europe and Asia, Angelica archangelica from southern Europe, (all illustrated below) and Echium vulgare from western Europe (including Britain). About 70% of plants in my garden are of European origin. I also include a wide variety of flower shapes and sizes, to help cater for the diversity of insect mouthparts and specialisations evolved to tackle different forms of flower. I then plant to ensure a succession of flowers from March to October, such as Symphytum 'Hidcote Blue' for March to May, and Aster novae-angliae 'Purple Cloud' from August to October. I prefer to plant flowers in groups of “drifts” if space permits, as did Gertrude Jekyll. There is evidence that insects have to learn to use each different flower type and shape, and that they prefer large stands of the same species. The honey bee “waggle dance” evolved to pass on information about large stands of suitable flowers. I include some insect-friendly exotics. 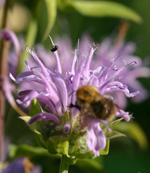 Monarda fistulosa from the USA is commonly known as Bee Balm or Bergamot. 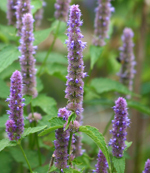 Anise Hyssop, Agastache foeniculum is another American flower, as are Penstemon heterophyllus, and Aster novae-angliae “Purple Cloud”, a cultivar of the New England Michaelmas Daisy. You have to be careful with Michaelmas Daisies, as many are very weedy or invasive, and wildlife gardening planting lists are often too vague. A.novae-angliae is non-invasive. 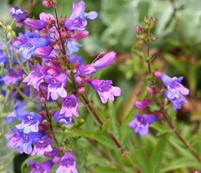 Many bee-friendly plants have blue or purple flowers. Bees can’t see the red end of the spectrum, but their vision extends into the near ultra-violet, so they like blue and violet. It is believed that night-feeding moths are often attracted to night scented and pale or white flowers. My pollinator border is a “terrestrial coral reef”, not only a mass of disparate shapes and colours, but alive with the movement of small creatures – but insects, not fish.